All those TV spots add up: Nonparty organizations have spent $20.6 million so far in the 2013-14 election cycle, more than three times their spending at this point in the 2011-12 cycle, according to an analysis by the Center for Responsive Politics. Aside from candidates’ own campaigns and traditional party committees, there are several types of nonparty political organizations. They include traditional PACs that contribute directly to campaigns and so-called “super PACs” that can’t give money directly but can spend unlimited amounts independently of campaigns; both types must disclose their donors. Another category, politically active nonprofits, don’t have to disclose their donors; for that reason, the Center for Responsive Politics calls them “dark money” organizations. 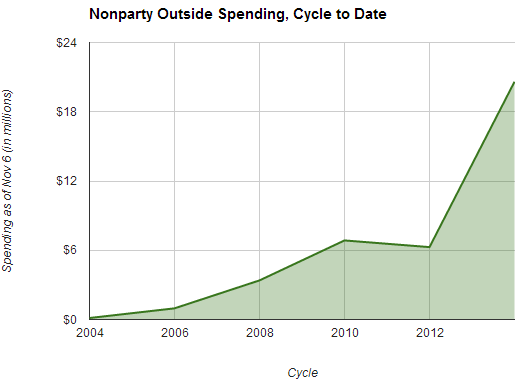 Such groups have spent $2.5 million so far in the 2013-14 cycle, accounting for 12% of all nonparty spending. At this point in the last cycle, “dark money” groups had spent less than $441,000, representing 7% of total nonparty spending. Most of the “dark money” spent so far in the current cycle has been by liberal groups; over the past three cycles conservative groups had dominated that area of campaign finance. (The center characterizes a group as “liberal” or “conservative” based on its spending pattern.) The League of Conservation Voters, for instance, spent more than $800,000 to support Ed Markey (D-Mass.) in this summer’s special Senate election; Patriot Majority USA has spent almost $558,000 opposing Republicans Mitch McConnell (Ky.) and Tom Cotton (Ark. ).